he lush landscapes of the tropics seem unattainable to most gardeners but the lure is irresistible. Actually, many of the plants we use regularly in the garden come from tropical climates - we simply think of them and use them as annuals. The word tropical, however, conjures up visions of enveloping leaves, glistening with moisture, as well as full-blown, enticingly fragrant flowers. Many of these tender plants grow successfully in containers so you can surround yourself with a lavish jungle on patio or deck all summer. Take the plants below - trailers, vines, perennials and annuals - as the beginning of your seed-grown paradise. Familiar as houseplants, asparagus ferns add a green veil to a patio or deck when you hang them from the eaves and an airy accent when you put them in containers on pedestals. Two species are available as plants or seed. Asparagus myersii or meyerii produces still, rounded plumes somewhat wiry in appearance. The plumes are various shades of green and plants have a mounded habit. Asparagus sprengerii plants have long, arching plumes. More readily available than meyerii, this asparagus is heat and drought tolerant and can be used as a ground cover in areas with little frost. Indigenous to Suth Africa, asparagus fern - the species and the Sprengeri group - is not a true fern; it is a member of the lily family. It is somewhat drought tolerant as long as it grows in partial shade. Start seeds indoors any time of the year by soaking them first in warm water for 24 hours to enhance germination, which takes 3 to 4 weeks. Plant seedlings in a light, somewhat acidic soil. During the summer, the plants need a lot of fertilizer, especially when they spend the season outdoors. When yuo bring them indoors for winter, cut back on feeding until spring arrives. Cannas grow from rhizomes, but you can start them from seeds, especially Canna 'Tropical Rose' (a 1992 All-American Selections Winner). 'Tropical Rose' is a dwarf canna, growing only 2 to 3 feet tall. The soft rose blooms are produced on a spike held above the foliage. From sowing to flower takes about 90 to 100 days. It is recommended to start seeds indoors. All canna perform best when grown in warm soil with full sun and warm growing conditions. Cannas have broad green, bronze, or multicolored leaves, which are reason enough to place this plant in your garden or in a container but the striking white, yellow, pink, orange or red flower spikes give an additional motive. These tower above the foliage from early summer to frost. Set tall plants in the rear of a border; use dwarf ones, such as 'Tropical Rose,' in containers. Start seeds indoors 6 to 8 weeks before your average last frost in spring or directly in the garden after all danger of frost has passed (the latter is best for areas with long growing seasons). To facilitate germination, nick the seeds and soak them overnight in warm water; they germinate in 1 to 2 weeks. Cannas need a lot of water and fertilizer to be grown to perfection, but they are able to endure fairly dry garden conditions, and even drought. They are winter-hardy only to Zone 8; they may survive winter in Zone 7 if you mulch the bed heavily. In other zones, to save the plants for subsequent years, after a hard frost dig up the rhizomes, which form during the season, and store them indoors in a cool, dry place. Native to tropical Africa, the castor bean is a shrubby plant that produces very large, palm-like leaves. It grows 6 to 8 feet tall and about 6 feet wide in one season, so use it as a specimen or as a background planting. New leaves of green varieties have an attractive bronze-red tinge to them, or the entire plant may be purplish in color. The clusters of small flowers are not very noticeable, but the spiny seedpods are. If they tempt you to incorporate them in arrangements, remember that the seeds, and all parts of the plant, are toxic. In public areas, or gardens which children might visit, it is prudent to clip off the flower heads before the seeds form. After all danger of frost has passed, sow seeds where you want the plants to grow in the garden, or start them indoors 6 to 8 weeks before your last frost. Seeds germinate in 15 to 20 days. Give the plants enough space to spread, full sun (plants will be shorter if you put them in partial shade), well-drained soil, a lot of moisture, and 4 to 5 feet between them. They love the heat; in Zones 8 to 10 where there is little or no severe frost, they grow as perennials. Familiar as a plant for shade, coleus produces muted as well as brightly colored variegated leaves, which create season-long interest in what can otherwise be dreary sites. From tropical Africa and Asia, coleus is an annual that fits perfectly in containers, alone or in combination with other annuals, as well as in the ground under deciduous trees and shrubs and as an edging for a perennial border. 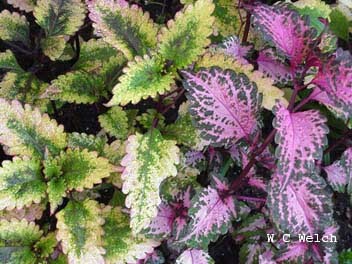 'Rainbow' and 'Wizard' coleus can be grown from seed or plants and need shade for best performance. Sow seeds indoors at any time of the year (coleus make fine houseplants). Start them 6 to 8 weeks before you want to plant them outdoors; do not cover the seeds because they require light to germinate, which they do in 10 to 15 days. Most coleus branch best if you pinch the growing tips of young plants occasionally. As the lavender-blue flower spikes form later in the season, cut them off as they tend to detract from the foliage. As the end of the season nears, let the plants go to seed if you are interested in having seedlings appear the next spring. There are often a wonderful diversity of colors and forms. Some coleus have been vegetatively propagated from cuttings. Many of these varieties have been bred to be sun tolerant. Look at plant labels to identify if you are purchasing a coleus plant to be grown in the sun or shade. Gorgeous, large, fragrant white blooms open in the evening. The perfect place for this is near a patio or deck whre you can enjoy the scent. Widely distributed in the tropics and subtropics of Mexico and Central America, moonflower, or moon vine, requires a sturdy support since the plants are vigorous and weighty, climbing 12 to 15 feet during the season with large, bright green leaves. Combine moonflower with its relative the morning glory (I. purpurea and others), for a daylong display of blue and white. For best germination, nick the seeds and soak them overnight in warm water. Sow seeds outdoors along an arbor or trellis in full sun and then seedlings to 10 to 12 inches apart. You can also sow them indoors in peat pots 6 to 8 weeks before your last spring frost. They germinate in 7 to 10 days. Guide vines in the beginning as they statr to climb. Moonflower is a perennial in Zones 8 to 20; in other zones, treat it as an annual. (Reproduced with permission from the National Garden Bureau).